IRVINE, CA--(Marketwired - Apr 17, 2013) - Toshiba America Information Systems Inc., Telecommunication Systems Division (Toshiba -- www.telecom.toshiba.com) has helped New Method Wellness (www.newmethodwellness.com) meet its communication goals with a new IPedge® business telephone system. 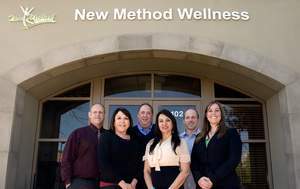 Based in San Juan Capistrano, Calif., the New Method Wellness center for addiction treatment provides care for detox, primary care, dual diagnosis, trauma treatment and extended aftercare designed to assist individuals in their successful recovery from addiction and co-occurring disorders. Empowering employees to communicate more effectively with the center's clients, families and each other. Patrick Orr, sales manager at Authorized Toshiba Dealer smplsolutions (www.smplsolutions.com/toshibasolutions) of Lake Forest, Calif., recommended Toshiba's IPedge. He said, "Toshiba's IPedge delivers the reliability and features desired by New Method Wellness in an affordable, easy-to-use system." smplsolutions has been an Authorized Toshiba Dealer since 2001. Enterprise Manager for simple, browser-based administration and management. Toshiba's IPedge met New Method Wellness' requirement for an affordable and intuitive IP business telephone system with virtually unbeatable reliability. The IPedge has more than 200 telephony features, including Unified Messaging and the Enterprise Manager self-administration application. The Toshiba wireless DECT phones allow users to be mobile at work and not miss any incoming calls. IPedge's Unified Messaging enables users to access their voice and email messages from a single inbox. It also allows the center's executives to receive their emails on their smartphones. Integrating voice and email messages into a single platform helps the users quickly handle their messages so they are more effective in working with their clients, families and each other. With Toshiba's Enterprise Manager application, the center can self-administrate its own IPedge business telephone system, including making simple adds, moves and changes. This helps them make necessary changes quickly and easily, without the cost of service calls. Installation and maintenance by an Authorized Toshiba Dealer. "Together, Toshiba and smplsolutions exceeded our expectations, giving us exactly what we wanted: an affordable, reliable business telephone system from a brand we trust," said Bing Crosby, CFO, New Method Wellness. "With Toshiba's IPedge, New Method Wellness' users are empowered to communicate more effectively with their clients, families and each other," added Gianna Santi, marketing manager, smplsolutions. Toshiba's IPedge business telephone system delivers multiple unified communications applications on a single Linux server, including call processing, voice mail and unified messaging, Call Manager unified communications, meet-me conferencing with Web collaboration and video, native SIP line and SIP trunk support, mobility, networking with other IPedge and/or Strata® CIX™ systems, centralized administration, survivability, and feature-rich telephone endpoints. It also includes Toshiba's IPMobility client application, delivering single-number reach to Apple® and Android™ smartphone devices for both incoming and outgoing calls. For more info on IPedge, visit http://www.telecom.toshiba.com/Products/IPedge-IP-Telephone-System.cfm. For an Authorized Toshiba Dealer, visit www.telecom.toshiba.com. To subscribe to the Toshiba Telecom Blog, visit http://blog.telecom.toshiba.com/. Follow us on Facebook (ToshibaPhoneSystems), Twitter (toshibaphonesys) and LinkedIn (Toshiba-telecommunication-systems-division). About Toshiba America Information Systems Inc.
Toshiba America Information Systems Inc. Telecommunication Systems Division is one of the three business units of Toshiba America Information Systems Inc. (TAIS) and offers business communication solutions for SMB enterprises and enterprises with multi-site or regional locations. Toshiba's VIPedge cloud-based business telephone solution supports up to 500 users, and the IPedge and Strata CIX systems support from 8 to 1,000 users and offer Voice over IP, voice mail and unified messaging, conferencing and collaboration, unified communications applications, networking, mobility and more. Together with Toshiba's PCs, tablets, copiers, and surveillance video cameras/recorders, Toshiba's Telecommunication Systems Division helps enterprises maximize business efficiency in communications and mobility. For more information, visit www.Telecom.Toshiba.com. Headquartered in Irvine, Calif., TAIS is an independent operating company owned by Toshiba America Inc., a subsidiary of Toshiba Corporation, a world-leading diversified manufacturer, solutions provider and marketer of advanced electronic and electrical products and systems. Toshiba was founded in 1875 and today operates a global network of more than 550 consolidated companies, with 202,000 employees worldwide and annual sales surpassing 6.1 trillion yen (US$74 billion). Visit Toshiba's Web site at www.toshiba.co.jp/index.htm. © 2013 Toshiba America Information Systems Inc. All rights reserved. All product, service and company names are trademarks, registered trademarks or service marks of their respective owners. Information including, without limitation, product prices, specifications, availability, content of services, and contact information is subject to change without notice. Patrick Orr and Gianna Santi of smplsolutions (on ends) provided Susie Hopson, Ed Blum, DeAnna Jordan, and Bing Crosby of New Method Wellness with Toshiba's reliable, feature-rich IPedge business telephone system.